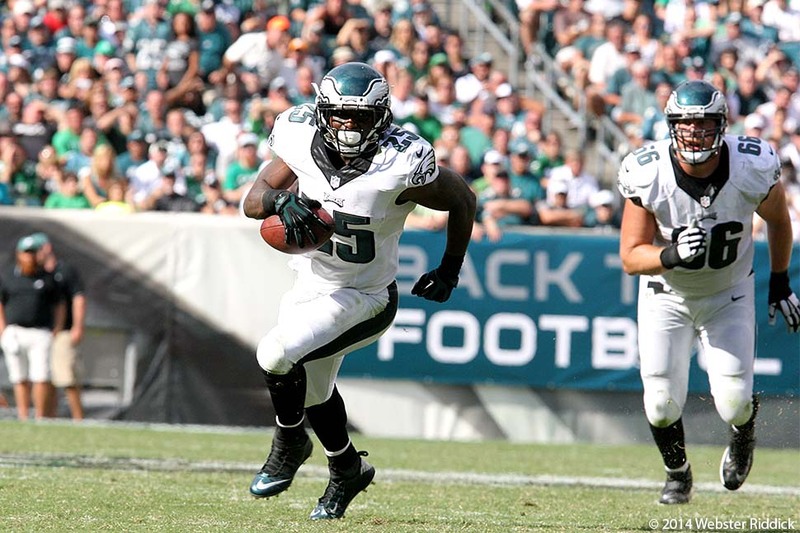 Eagles running back LeSean McCoy had an easy day against the Dallas Cowboys. Photo by Webster Riddick. For all the talk of a new and improved Dallas Cowboys squad with the running of DeMarco Murray, the Philadelphia Eagles reminded Tony Romo and Co. that the Birds are still defending champions of the NFC East until someone knocks them off. The way things looked in this game today, it could be awhile before someone takes the crown from them. The Eagles dominated the Cowboys in every facet of the game in a 33-10 Thanksgiving Day rout at AT&T Stadium in Arlington, Tex. The 9-3 Birds took sole possession of first place in the NFC East with the next Seattle Seahawks coming to Lincoln Financial Field in about 10 days. Running back LeSean McCoy looked like the guy who led the NFL in rushing last season. He juked and blasted his way through a porous Dallas defense for 159 yards and one touchdown. McCoy’s 38-yard touchdown ended the competitive portion of the game by the end of third quarter. For the game, the Eagles rushed for 256 yards on the ground. McCoy and the other Eagles running backs were able to run through because of the offensive line of center Jason Kelce, left tackle Jason Peters, left guard Evan Mathis, right guard Andrew Gardner, and right tackle Lane Johnson dominated the Dallas front seven. The Birds fast-paced offense jumped out to a 14-0 lead in the first quarter and was never really threatened in this game at any point. Quarterback Mark Sanchez managed the game well and finished the game with zero turnovers.He was an efficient 20-of-29 passing for 217 yards with one touchdown. To be honest, Sanchez did a little more than just manage the game. He made plays when needed to play in the passing game, hitting Jordan Matthews for a 27-yard touchdown pass in the first quarter. “I think he’s getting more comfortable,” Kelly said. “He missed an entire year of football. There’s no substitution for playing. He played well in the preseason, but then sat until the Houston game. Sanchez didn’t look bad running a few a read-option plays as well. He gained 28 yards on seven carries and scored the game’s first touchdown on the Eagles first drive of the game. Meanwhile, the Eagles defense simply shutdown Murray, the NFL’s leading rusher and held him to a season-low 73 yards rushing. They also roughed up Romo, sacking him four times and picking off two of his passes. They held him without a touchdown pass for the first time in 38 games. The Birds held the Cowboys to 267 yards of total offense. “We knew coming into the game, we had to get after them, hit ‘em hard, hit ‘em often as I said earlier in the week,” said defensive end Fletcher Cox, who had four tackle including two for a loss and one sack. Things aren’t getting any easier for the Eagles when they come back because they have another tough game against the defending Super Bowl champion Seattle Seahawks, who haven’t allowed a touchdown in their last two games.